During the 1960s, FC Barcelona saw a relentless increase in membership numbers. Paradoxically, this did not go hand in hand with sporting success. At the same time, Catalonia received a large number of migrants and it was in this context that Barça became an important mechanism for integration in Catalan society. Irregular sporting success and economic austerity, partly due to the construction of the Camp Nou, meant that the Club was unable to sign big players; this was reflected in Barça’s results. During the 1960s, Catalonia’s population grew by more than 1,200,000 inhabitants. This was largely due to waves of migration from the south of Spain. Many people were attracted to Barça because of its democratic spirit, its inter-class consciousness and its overtly anti-centralist stance. 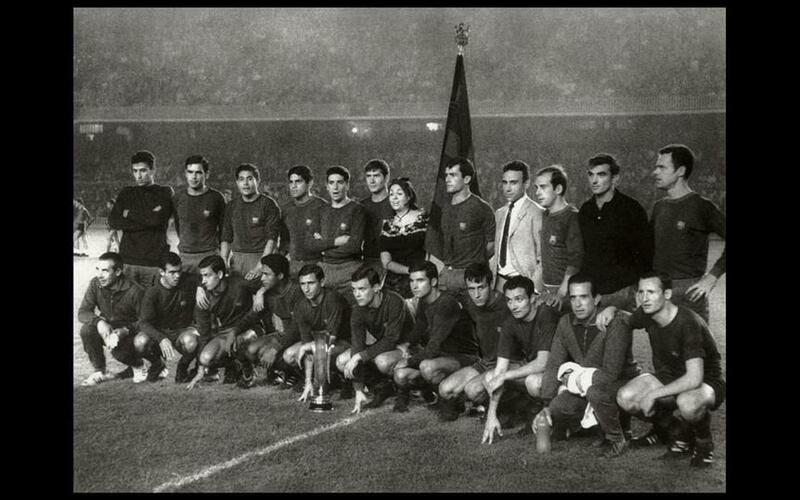 The identification of Barça with Catalonia was no longer limited to members and fans born in the Principality. Barça consolidated its role as a catalyst for social integration. This had happened previously in the 1920s when people from Valencia, Murcia and Aragón migrated to Catalonia, and it would happen again at the end of the 20th century, when immigrants would arrive from other continents. In the 1960s, football was broadcast on television for the first time. The first game in Catalonia was broadcast in 1959. Because televisions were so expensive, the first Barça matches broadcast on television were watched by crowds of people standing outside shops that sold televisions, or in bars and restaurants throughout Catalonia. The “curse of the square goalposts” in Berne proved decisive in Barça’s failure to win the 1961 European Cup Final; this marked the beginning of an unsuccessful period of sporting history for the Club. The Five Cup era, and the time of Helenio Herrera, had come to a definitive end. At the end of the season, László Kubala’s departure made it even more obvious that Barça’s glory had come to an end. That Antoni Ramallets, the great goalkeeper, left the Club, followed by Tejada and Czibor, was further evidence of Barça’s decline. When Segarra left in 1964, this marked the end of the golden generation. The incoming Barça president Narcís de Carreras, during his acceptance speech on 17 January 1968, stated “Barcelona is something more than a football club”. A short time later, this gave rise to the motto “Barça is more than a club”. His son Lluís remembered that his father had a written copy of his speech — something he did not normally do — and that this famous saying had been written conscientiously. Although it was impossible that the speaker could imagine the impact his words would have, and still have today, it is clear that he was aware they meant something special. The sudden death of the footballer Julio César Benítez, aged 27, on 6 April 1968 was one of the saddest days ever for Barça fans. His death was a hard blow for both his team mates and the fans, at a time when Barça was not performing well. It happened on the day before a Barça-Madrid match, which was cancelled. Thousands of people came to pay their last respects to Benítez as he lay in state at the Camp Nou. Mourners included Barça fans, as well as supporters of other teams. The Spanish Cup final, which took place at the Santiago Bernabéu against Real Madrid, has gone down in history as “the bottle final”. This name came about due to an incident that occurred only minutes from the end of the match, when spectators threw glass bottles at Barça players. Despite the hostile atmosphere, Barça beat Madrid 0-1 in a heroic victory.